'Bachelor in Paradise' Finale Will Have Sean Lowe, Catherine Giudici & More 'Bachelor' Couples, But Why? Last week, host Chris Harrison promised that the Bachelor in Paradise finale rules were going to change and things were going to get dramatic. But what he didn't mention is that past Bachelor couples would be joining the show for some sort of ritual. There's not a whole lot to go on besides a single promotional picture, but since the episode doesn't air for several more hours, I have all the time to over analyze it for you. So what the heck is going on in this picture? 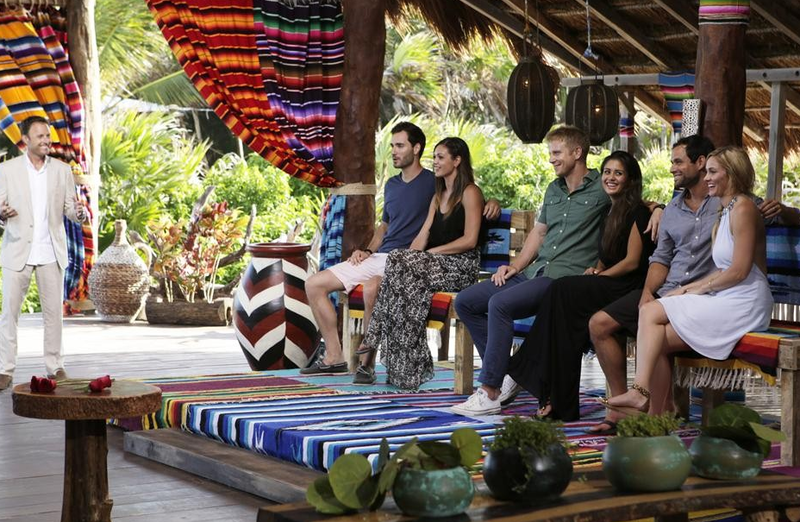 Let's start with what we definitely know: this is the set of Bachelor in Paradise so they're all in Mexico. The couples that are there are Desire Hartsock and Chris Siegfried, Sean and Catherine Lowe, and Jason and Molly Mesnick. All of the men have apparently been instructed to put their arms around their significant others to show their love, and there is a table full of roses visible on the far left side of the photo. Harrison is there, which means this is more than a friendly rendezvous, but likely an important moment in the episode. It's very apparent that they are participating in some sort of tribunal, arranged along the bench like that. So what are they doing there? I mean, this is the cream of the Bachelor crop when it comes to successful romances. Who better to decide on a relationship winner than these six people? They'll be able to spot a happy couple from a mile away. These couples know how to make a TV romance last, so if Bachelor in Paradise wants any long term pairings from this show, it makes sense to have the contestants go to past winners for help. Technically Des and Chris aren't married yet but they've passed the year mark and in Bachelor land, that's a big deal. They're worthy of being able to pass on advice to the others. They look pretty happy, so perhaps they're witnessing a proposal or watching Chris marry one of the show's more serious couples like Lacy and Marcus or maybe Cody and Michelle. There's no better way for these three couples to reaffirm their love than to give their partner another rose. But I only see four roses so maybe this will be like BIP and there won't be enough for every couple. Looks like someone is going to get sent home! In an attempt to upstage Juan Pablo and Nikki Ferrel's announcement that they've joined VH1's Couples Therapy, perhaps ABC is holding a counseling session of their own with their past couples. I mean, how well do the former couples really know each other? Their love should probably be put to the test and Chris Harrison seems like the man for the job. Will any of my musings actually end up coming true on Monday night's show? I sure hope so because then I can say I'm psychic, and that would be almost as cool as getting a rose in the final BIP rose ceremony.